The next size up from our elementary bike, this unit is best suited for children from ages 10 to young adult. Built for commercial high use applications it can handle children of any weight! The computer and magnetic tension system is simple to use and provide feedback for calories time speed distance. The computer accurately displays the heart rate of the user through contact heart rate located on the machines handles. Age recommendations: 10-15 Product Weight: 130lbs Weight limit: 200lbs Dimensions: L 36"xW 36" xH 60" ***Comes standard with contact heart rate sensors. Available optional ear sensor must be requested. (add-on). 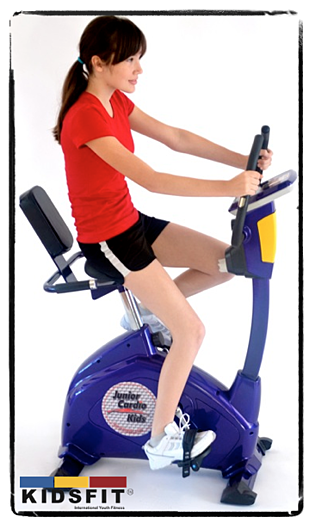 The Junior Semi Recumbant allows for a variety of beneficial movements and individualized student plans. Computer provides: time, speed, distance, RPM, brake level, energy consumption, pulse rate, battery indicator, and Recovery Wellness Grade. The front transport wheels make moving the bike from room to room super easy!